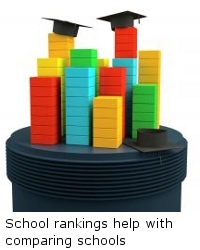 What is a school ranking? A school ranking is a way of measuring the performance of a school against its peers. In order to have a unit with which to measure, several systems have evolved based on testing scores and/or numbers of tests administered. In Virginia, these scoring systems include Virginia Standards of Learning (SOL) Scores, SAT Scores, and The Challenge Index. Why are scoring systems used? While each of the scoring systems has a specific purpose (for example, SOL tests were created to make sure that what is taught classrooms is more homogeneous throughout the State), many people use the test results for the purposes of comparing schools. How can each of these scoring systems be used to compare schools? Virginia Standards of Learning (SOL) tests are administered in grades 3rd- 8th and at the end of high school-level courses. Some websites have created their own school rankings by using the percentage of students who have scored at or above the proficient level for each SOL test (i.e. “pass”), massaging the data, sorting it and assigning an overall score to help compare each school with the rest of the schools in the State. While SOL scores might be the only way to compare elementary and middle schools, there are at least a couple of other test results that can be used to compare high schools. One of these tests is the SAT Reasoning Test (SAT). High school students take this standardized test in order to apply for college. To be able to compare results, many schools compile their students’ SAT scores and publish them as an “average combined score” as well as the “number of students who scored above the national average”. However, there has been controversy concerning how effective it is to rank schools based on their SAT scores, since these scores can be closely related to socio-economic status. For this reason, and hoping to uncover great schools which challenge their students regardless of status, Jay Mathews of The Washington Post created The Challenge Index. The Challenge Index is a method for comparing high schools across the United States based on the number of Advanced Placement (AP) or International Baccalaureate (IB) courses offered by a school as well as by the number of graduating students at that school. While scores can highlight certain schools as being better than others based on test results, this shouldn’t be the only criteria used to select a school. A decision on which school to select should also be based on any desired special programs, as well as the recommendations from current and past students and parents. When Kathy found that the SAT scores weren’t giving her the answers she was looking for, she looked at another way of comparing schools. She then found The Challenge Index and came up with another short list of schools. Luckily, these schools had the programs that she wanted. Now, for her youngest child’s education, she wanted to find out the rankings of the elementary schools which fed into her short-listed high schools. She turned to the SOL testing scores and she was able to narrow down her results to a realistic set of schools which to visit for further interviews. When looking for the right school, researching available special programs as well as a school’s reputation are very important complements to school rankings. Download our How to choose the Right School report which includes an at-a-glance table with a compilation of the three most common rankings for all the high schools in Fairfax County. To download the report, go to the Free No-Tears Guide to Moving to Fairfax page.